Runaway Bridal Planner: Are you a runner? Can I spotlight you? If you read my blog, you probably know that each Thursday I spotlight a different runner from around the world. I decided to take this particular Thursday and see if any of YOU my blog readers are interested in being spotlighted. 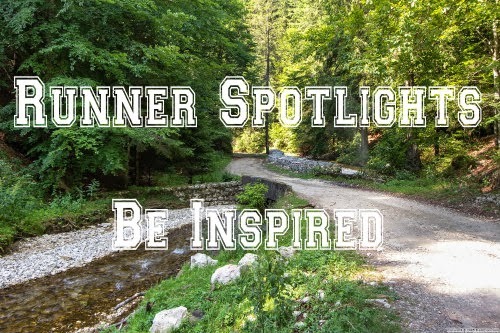 What kind of a runner do you have to be, to be spotlighted? ANY KIND! Runners come in all shapes and sizes, all speeds and distances, beginner or expert. You could have just gotten up yesterday and went out for your first run of 10 steps today, or ran your 100th marathon. I believe every runner has a great story, something inspirational about them that might inspire others to find their own motivation within to begin their own fitness journey. Even if you don't think you have something special to offer, let me spotlight you and prove you wrong! Because I truly believe everyone has something super special about them! Haven't seen my runner spotlights and want to know more about what is involved? You can visit this page HERE and click to see past spotlights that have been done. If you have a few minutes check a few out, there have been some amazing spotlights done! It actually quite easy, I provide you with all the questions you will need. You can answer all of them, or just the ones you want to answer. Then you just take a few minutes when you have them, and enjoy answering the questions. Have fun with your answers, or be as serious as you want, the choice is entirely up to you. How do you get a spotlight date reserved? I only do 1 spotlight each Thursday and I run them on a first come basis. So when I get your answers back I will email you the date of your spotlight. Depending on how many I get at a given time, your date could be a few weeks to a couple of months out. But don't worry if you forget about it, I'll send an email the day before it runs to remind you to come check it out, so you can share it with your family and friends. My only rule to my spotlights, you just can't put down any other type of runner/speed/distance in any of your answers. If you do, I reserve the right to remove that portion when I am putting your spotlight together. * If you want your Twitter or Facebook pages linked to in the spotlight, consider it a done deal. I actually also try to copy you on Facebook and Twitter when I do my daily social media mentions about the spotlight. Don't worry about personal information. I won't link to personal facebook pages (Unless you ask me to) and I only include your FIRST NAME in the spotlight. You can mention where you are from if you'd like, or if you'd rather, you don't have to. Just shoot me an email, or ask me in the comments below and I will get back to you! So what are you waiting for, let me take a Thursday and turn it into YOUR day. You are unique and you never know who you'll inspire by sharing a bit about why your a runner! For those interested, its simple. * Just send me an email. * If you are a blogger, send me a link to your blog and I'll do my best to personalize a few of the questions for you. But if you don't, don't worry I have lots of fun questions that fit runners of all kinds! You will need to add the @ and the . to the email address. I wrote it this way to keep spammers away! If your interested, I would absolutely love to spotlight you! Send me an email at anytime, and I'll get back to you between 24-48 hours with your questions. You can take your time and get them back to me when you have them finished!